I’ve been using Blogger since 2005 and like it quite a lot. To me it generally seems much easier than managing the security of a self-hosted Wordpress blog and easier than creating my own blog software in Ruby on Rails. However, I have recently noticed an increase in comment link spam from various off-shore locations, advertising second rate (or worse?) web businesses. It turns out that Blogger provides some sufficient looking moderation functions. 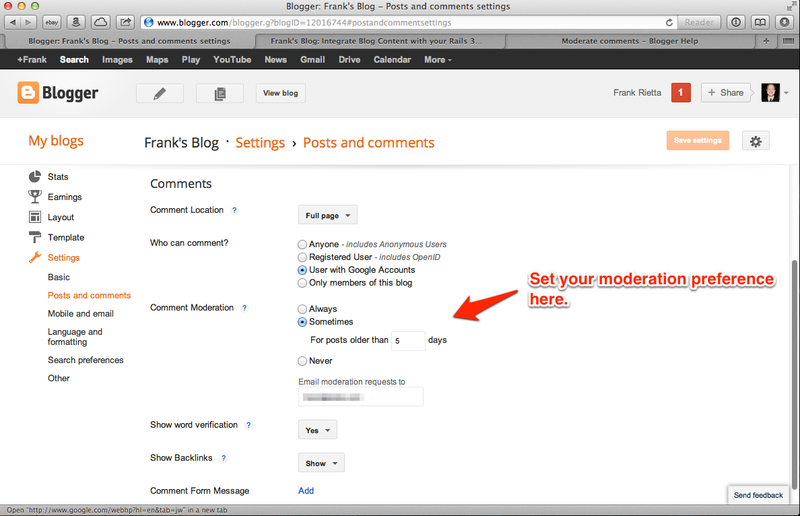 To set this up for yourself on your own Blogger site, go to “Posts and comments” under the Settings area. Scroll down to the Comment Moderation section and choose wither Always or Sometimes. I’ve personally chosen to only moderate comments posted to older posts.